On Sunday I ran to the summit of Castle Crag via Sheafman Creek northwest of Hamilton. The run to the lakes at the head of Sheafman was straightforward, albeit with several creek crossings, some serious bogs, and many roots and downed trees. Those are the things that make it interesting. 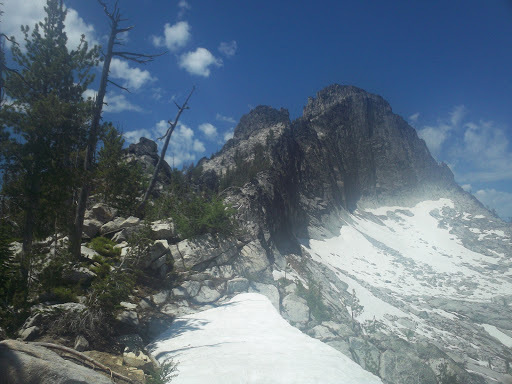 From Knaack Lake, I ascended a talus slope, and then climbed good granite talus bolders to the summit at just under 9000′, losing elevation a few times to avoid gendarmes. On the descent, I opted for a short section of very low 5th class, just for kicks and to stay near the ridge. 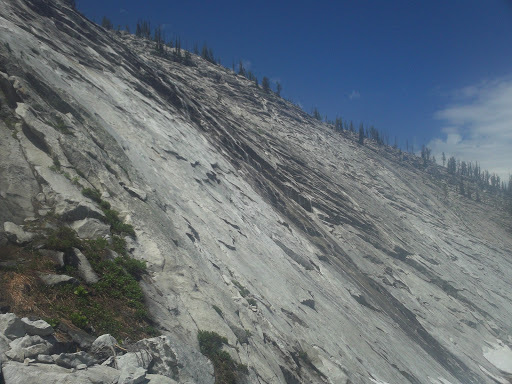 I descended to Aichele Lake via a short and steep-ish couloir. From there it was a straightforward run out, with plenty of highstepping over mud and roots. I felt really good on this one all day until the last 3 miles, when the mid-day heat caught up to me and I realized I hadn’t had enough to drink. I’m continually surprised by how much hydration can affect the way my joints feel, as well as my fatigue the next day. The precipitous 500′ East Face of Castle Crag. Good granite at the head of Sheafman Creek. I was surprisingly tired from the previous day’s run, so I took a very leisurely jog up to the saddle between University and Sentinel via the draw and down the Sentinel road. Early morning run up and down the most dominant feature (arguably) in Missoula’s viewshed. Despite living here for 6 years, this was my first time to this summit, partially because it’s so close and visible (although that’s not really valid; I’ve been up Stuart Peak probably 6 times). It’s definitely as worthy as anything else in the Root, and it’s close enough to hit before or after work. Ran every step of the 2400′ climb to Carlton Ridge, and continued down to Carlton Lake. 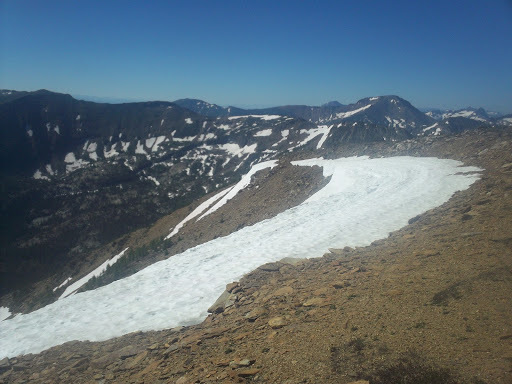 I foolishly took the Summitpost route here, over the dam and to the low pass between Carlton Creek and One Horse Creek before gaining the ridge. This takes you in the entirely wrong direction, adds more than a mile and an extra 500′ of gain, along with some krumholz-whacking and gendarme skirting. If I had made the sensible choice to go directly up the northeast face, I am certain this run would have gone in under 3 hours. Next time. Views from the top were good, with Big Joe especially prominent to the south. What a mountain that is, almost invisible from the valley floor but 600′ higher than anything in the range and massive. Things seemed pretty hazy, and I could only vaguely see the Missions and the Swans. Smoke season, I guess. Descended back to Carlton Lake via the correct route, and ran 6-7 minute pace (which is pretty fast turnover for my uninitiated legs) down the switchbacks to the truck, and was back in Missoula working by 11. Previous PostThe reverse Q continues: A double crossing of the Tetons and fireworks.Next PostOfficial training.